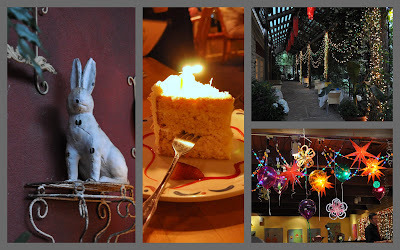 While we were in Austin, visiting Children and Grandchildren last weekend, they took Tall Husband and me out for a combined birthday dinner (Tall Husband's birthday is nine days after mine, so we often celebrate on the same day.) Who do you think chose the restaurant? That's right...I did! How did you guess? 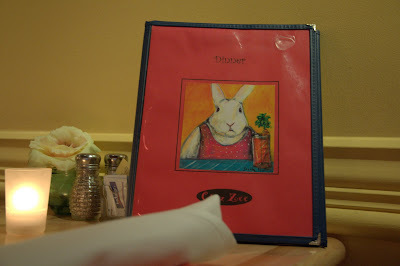 Chez Zee is a bistro that has about as many bunnies as there are at The Bunny Bungalow. Note: Come back later to see more Texas Hill Country treats. That is such an adorable place!! Happy Birthday once again. Happy birthday! Always looking for a new place to eat in Austin. Thanks for the tip! This must be bunny heaven! My kind of place (as you know)! I've really been enjoying all your posts, Annie. Thanks for sharing!